If you’re doing a job around the house or looking on-line how to fix it yourself. You’re going to need the right tools. – Try tightening the faucet with your good looks. You need the right tools or ammo to hit the target. 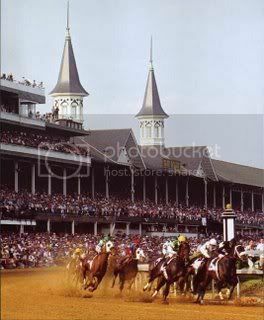 As we are days away from the 142nd running of the Kentucky Derby here are some tid-bits that might just help you in your quest for finding the winners. 1.- Watch the replays = Winning Ponies offers all of the replays from every major prep race for both the Oaks and Derby. – There is nothing like getting that visual image in your noggin to get you thinking before you start your process. 2. – Know your bankroll = If it is $1,000 or $50, know what you can afford to put into play. I’ve never won on scared money, and borrowed money doesn’t work when you are desperately trying to win. – Take a look at what you have to play, and then handicap. If you put in two hours handicapping the card, you need to spend the same amount of time deciding how to put it into action. I know more great handicappers and bad gamblers than the law allows. – Deciding on how you’re going to use your ‘bullets” is just as important to who you’re going to play. 3.- Don’t try new wagers on big days = If you’re not a pick-six player, don’t try to be one on Derby or Oaks day. More good players get caught up in the hoopla, and try the hardest wagers on the toughest days. You’ll want to work that into your game long before the big day, and this will help you understand the process. – I won’t say you can’t win, but it is an uphill battle to cashing these tough wagers. 4.- Read = The week prior to the Derby you’ll want to read everything that is going on in Louisville. – Pay attention to the weather, the final workouts, and how the horses are shipping. – Has the trainer been there before ? Is the rider a marquee player who rides these types of big races ? – Who are the scribes that cover the race like ? – Be sure to watch the post position draw. You’ll hear the trainers and owners, and how they feel about the post. – Add all these up and you’ll find yourself being a more prepared player. 5. – Have a secret weapon = Winning Ponies has been in the game for a long time, and with over $3,471,067 in exotic payouts this year you can feel confident following proven data. – Every gambler, contest player, and weekend warrior has a secret weapon that gives them an edge. – Winning Ponies gives you a full and complete picture on how the race will shape up, and this allows you to spend more time putting the easy-to-use data to work. - Let this be your secret weapon. There are many sites that claim to pick winners, but very few uncover the race and show you how to separate the pretenders from the contenders. – If you’re a new player or a seasoned pro, the Winning Ponies E-Z Win Forms are easy to use and will allow you to gain that edge to make a difference. – The selections are in tier levels and you have the ability to change the weather tab and receive a brand new of updated E-Z Win Forms to adjust to the track conditions. Many data services put out selections and charge you one price. If you play just one race at the end of the day or have the entire card they charge you. – Winning Ponies allows you to be in charge. If you’re getting a late start, you’ll only be charged for the races you use. – You can follow along and see how the E-Z Win Forms are doing in the result section, and you’ll see the E-Z Win Predictions results in real time. With only five days until the Kentucky Derby, you need every advantage you can have. – Go back and watch the free replays, listen to the podcasts from the Winning Ponies Internet Show, and be sure to check back for stories and free selections. – Let Winning Ponies be your one-stop-shop for all of your handicapping needs, and you’ll be more prepared for the day. Best of luck from your friends at Winning Ponies, and hopefully we’ll see you in the winner’s circle ! Improve our choices by letting us select individual races from multiple tracks. Sure it would promote more participation and loyalty. Many days I purchase nothing as I play maybe a dozen races at 2/3 tracks. You could set a minimum purchase if needed. Services providers must continue to provide greater flexibility in providing choices. I agree with Dave. Living in Las Vegas I do most of my betting at the casino race books. I will bet several different tracks over a 2-3 hour period. Being able to select races rather then tracks would be a great improvement for me.